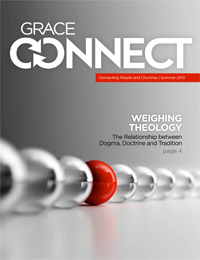 The Summer 2013 issue of GraceConnect magazine, the free publication for members and attenders of Grace Brethren churches, is in the mail this week. This is the first issue that is not being sent in bulk to local churches. Complimentary subscriptions are available to receive it at home. Simply email Ann Myers or send your mailing address to GraceConnect, Box 544, Winona Lake, Ind. 46590. Articles from the magazine will be posted online throughout the next month. To read an online version of the magazine, click here. To view announcements that the local church may use in bulletins, slides, or newsletters, click here.